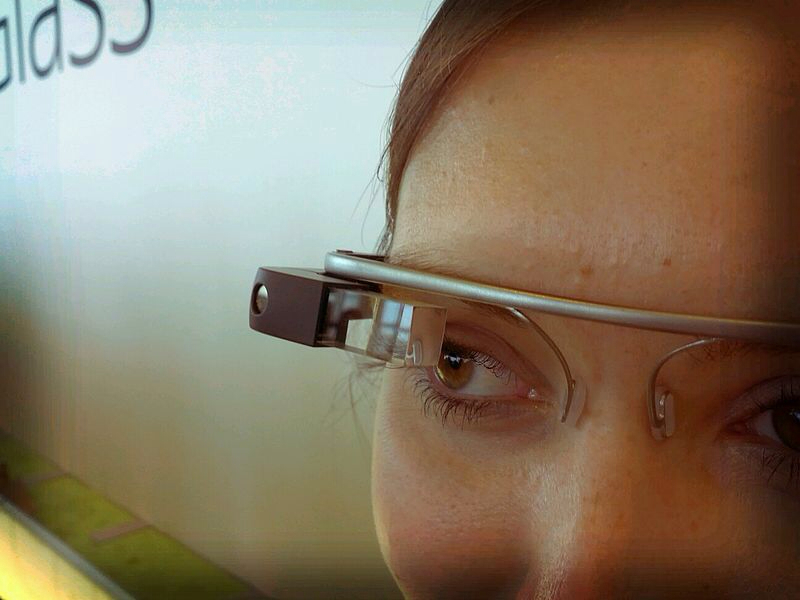 Take our poll: how do you feel about fellow transit riders wearing Google Glass? Google Glass. Photo by Antonio Zugaldia, via Flickr creative commons. In recent months, I’ve been reading with increasing curiosity about Google Glass, the glasses developed by Google which allow users to view the internet and take photos and videos. They are not on the market yet, but Google has been providing them to some members of the public for test runs. If Google Glass becomes popular, I’m curious about how transit riders view the devices. Are they just another cool gadget building on the advances of smartphones? Or do you think they’re overly obtrusive and a violation of whatever privacy you have left when riding public transport? Take the poll and feel free to comment please; one comment per customer please. I’m willing to bet that the first to support the ban on Google Glass will be law enforcement. They don’t want more people taking photos of videos of their misdeeds. You already see Youtube videos of officers telling people to illegally shut off the camera phones (remember the “don’t taze me bro” incident, the BART officer shooting, and the dog shooting by Hawthorne PD? ), imagine how corrupt officers will like the idea of everyone wearing Google Glass and once Google Glass wearers witness police over stepping their bounds, all they have to do is say “OK Glass, record” and it records the scene and uploads them instantaneously to Youtube for the world to see. We already have hard evidence that phone distractions are leading to an increase in pedestrian and other highway deaths. Now you won’t need to hold your phone in your hand as you drive, you can just put on your Google Glasses. If I had more confidence in our population’s ability to take personal resonsibility and avoid distractions so as to drive and walk safetly, I might be a interested in seeing this product developed, but considering the number of drivers I see ignoring hands free laws every day – I’m not looking forward to this “advancement’. I hadn’t thought of people trying to drive with these things on. Yikes! It gives everybody “robot vision” but without the processing power that a fictional robot might have. Not looking forward to the information overload there. On the other hand, you can get a camera built into a ballcap online or at an in person spy shop for less than $50. So anyone who wants to spy on you or surreptitiously take photos or video can already do so. People that are anti-Glass are idiots… like Calwatch said, you can build a better CHEAPER camera that records longer into a baseball cap for less than $50, when Glass costs $1650 (after taxes, fees, etc). Glass has about 45min of recording time before it runs out of batteries. But, more to the point, when was the last time you looked twice at someone holding up their phone? They could be recording. Glass is a gimicky new toy, that has hundreds of other functions besides recording because it’s an extension of your phone… I’ve had mine for about a month now, and you want to know how many videos I’ve taken? maybe 10…and they were of interesting things, like bands, or interesting landscape while hiking… you think I want to record your ugly face while I sit in the metro bored on my way to work? It’s not like EVERYONE doesn’t already stare at me, and since it lights up when it is recording everyone would know and say ‘omfg he’s recording us’. I’m in the same boat as Calwatch. Hidden cameras are lots of places these days, you can get them built into baseball caps and pens for much cheaper than Google Glass. True, those aren’t connected to the internet, but it’s the same concept. Not to put down Metro riders, but we’ve got an issue with cell phones being stolen on trains and platforms… you’d seriously wear a $1,500 Google Glass on Metro? Yeah. Good luck w/ that. Cops want to ban them? Sorry, most of the cops I know WELCOME more camera so they can get the vast majority of bogus police brutality cases thrown out with video evidence. Trust me. And as Collin said, you’d have to be nuts to flash any high-tech on the bus in these desperate times. I’ve waited around for LASD to respond to thefts I’ve observed and reported and the response times weren’t awesome.